The Temple women’s tennis team finished in third place at this weekend’s Atlantic Ten Championships in St. Louis, falling in the conference semifinals to Richmond. The Owls finished their season with an 11-12 overall record and a 6-3 record in the A-10 Conference. TTN File Photo/PAUL KLEIN Senior Anastasiia Rukavyshnykova hits a forehand against the Drexel Dragons in February. Rukavyshnykova will graduate from Temple this May. The Owls headed into play last Friday at 10:30 a.m. as the No. 3 seed. They faced off against 14th-seeded Big 5 foe La Salle and handled the Explorers with a decisive 4-0 victory. The Owls swept the doubles point and won the first three singles matches with victories from senior Anastasiia Rukavyshnykova, junior Lucie Pazderova and junior Theresa Stangl. Rukavyshnykova, Pazderova and Stangl won five of their six sets, 6-0, with the other set a 6-1 victory. The Owls advanced to take on No. 6 seed Massachusetts at 6 p.m. that same Friday. The Owls made quick work of UMass with a 4-1 victory. 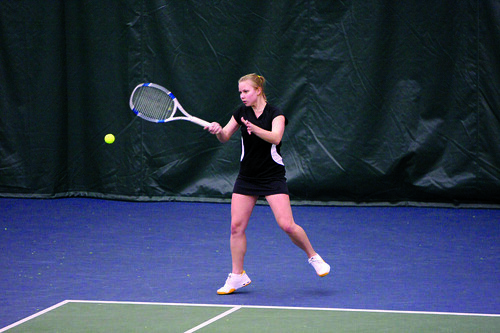 This match’s victories came from Stangl, freshman May Johnson and freshman Katharina Mittag. Mittag had suffered an injury in the last match of the regular season against Fordham but was able to make a full recovery and help the team make it to the conference semifinals. Despite Mittag’s contributions, the Owls’ season came to an end in the semifinals. The Owls squared off against the No. 2 seed Richmond Spiders. Temple lost, 4-1. The lone win for the Owls came from Johnson, who won her match in straight sets, 6-3, 6-1. Johnson finished her freshman season with a 16-5 overall record, including an 8-0 record in conference play. Only one of those eight wins in conference went to a third and deciding set. The A-10 Championship match came down to Richmond and the surprise No. 5 seed George Washington Colonials. The Colonials had defeated ninth-seeded Charlotte to advance to the championship. The 49ers had upset No. 1 seed Xavier. In the final conference match of the season, the Spiders came away victorious by a score of 4-0. All of their victories came in straight sets. The Owls had entered the conference championship with their own aspirations of taking home the crown. However, they should have a strong squad heading into next season. The majority of the roster will be back. Only Rukavyshnykova, who compiled an 18-11 record in singles this year, will be graduating. To offset that loss, the Owls will have senior captain Elyse Steiner back for next season. Steiner tore her anterior cruciate ligament last September but has been granted a medical redshirt season. The Owls will begin play again in September. Mauro said the goals will remain the same as this year’s. The men’s tennis team will head into the conference tournament having won 11 of its final 13 matches. Amazing how foreigners are so predominant in the USA college scene and now it looks like Russia dominates. Amazing! What happened to USA tennis?